Additional Info: We are delighted to introduce the latest addition to our caravan family. The amazing Willerby Aspen. This 3 bedroom caravan is Central Heated and Double Glazed, with free standing furniture and with its luxury level of finishing's it will not disappoint! It is our much loved family holiday home which we use ourselves but rent out to help cover costs. Ideally located on a brilliant site its ideal for your holidays. Short Breaks available all year round £150 - £450. Monday or Friday starts preferred. We can be flexible on dates please ask. This is our amazing luxury Willerby Aspen. This 3 bedroom caravan is Central Heated and Double Glazed, with free standing furniture and with its luxury level of finishing's it will not disappoint! Packed with extras including FREE WIFI, Bluetooth Speaker, a Play Station 4 with games and camping chairs for picnics on the beach it's perfect for your holiday. Ideally situated in Willow Way. Less than a 2 minutes walk to the main entertainment complex, splash pool, shop, restaurants and bars. The children's playground and launderette are less than 1 minute away. The fun fair, lake house & pool, boating lake, sports area and bike hire are only 5 minutes away. This is 1 of 2 caravans we own, the other being right next door. The references is 2274. Directly in front of the caravan there is a row of car parking spaces, with a flagged path leading directly to the door. No need to walk over grass or mud in wet weather. There is room for 1 or 2 cars at the side of the caravan on the grass, but we have always managed to park in front, so it leaves a nice area for children to play. There is a bench and picnic table outside the caravan. The caravan sleeps 6 in three bedrooms. A double with plenty of storage, a mirrored wardrobe with drawers below, bed side cupboards and a dressing table & TV. 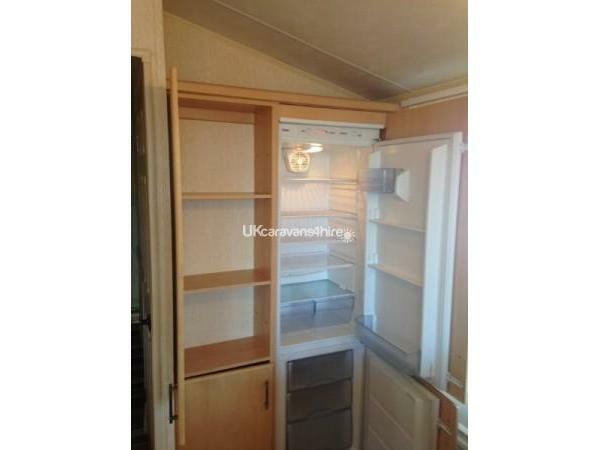 Two twin bedrooms each with cupboards over the beds, a bed side table, and a wardrobe. The curtains are much thicker than standard Haven curtains which makes a big difference on summer mornings especially if you have children and want a lie in. Please note there is NO SOFA BED in the lounge. Our caravan is wider than a standard van, 12ft instead of 10ft, and this is very obvious in the spacious lounge. Its amazing wall of windows at the front make it feel spacious. It comes with free standing furniture, a 39" television equipped with free view, a PS4 where you can access Sky and Netflix (if you have an account) a DVD player with a selection of DVDs, and games. There is a flame effect electric fire, and a ceiling fan. The kitchen has all the required utensils, Full size oven & hob, full size fridge freezer, toaster, microwave, kettle, pots and pans etc. And some little extras like a sandwich maker. It has a toilet with sink and a separate shower room also with a sink. This is handy when a family is trying to get ready at the same time. The shower is also bigger than the standard caravan shower. For your safety the caravan has smoke and carbon monoxide alarms, fire extinguisher and escape windows. Gas and electric are included in the price. Bed linen is also included free of charge and beds will be freshly made up for your arrival. Extra pillows are included for those who like 2! Entertainment passes are not included but are easily purchased from reception. If you email me I can let you know what they will cost but we think they are definitely worth it especially if you have children. A £50 deposit secures your holiday with the balance payable 4 weeks before your holiday starts, unless it is for the summer holidays when balances are due 6 weeks before the holiday. We book short breaks all year round, with holidays starting on either a Monday or Friday. We can be flexible with dates so please feel free to ask. On the day of your holiday I text you the key safe number and you can access the caravan from 2pm. On the day of departure please leave by 10am so our cleaner can prepare the caravan for the next guests. Leaving the caravan a mess or not on time will result in the loss of your care and respect bond. This all action 5 star Haven park has plenty to do on it to keep you busy all day long. It has direct beach access, a fun fair, go karts, army laser quest, mini golf, boating/fishing lake, bike hire, bar serving traditional pub favourites, fish and chip restaurant and takeaway, Papa John’s pizza takeaway, Spar Shop, launderette and children's playground. By purchasing the entertainment passes you have access to the indoor/outdoor pools (3) complete with slides and splash area, water activities and sports activities such as football coaching. You can also access the arcade with mini bowling. Passes grant you access to the entertainment complex with two entrainment rooms with bars, one aimed at children with character shows, games, disco and visiting acts like magicians. The other room has more grown up entertainment, cash bingo, bands and tribute acts. Children are welcome in either room. Also a comprehensive children's daytime entertainment programme run by the fun stars. Some activities are extra for example fun fair, bike hire and water sports. Should you wish to venture out Primrose Valley is ideally located to reach the nearby resorts of Filey, Scarborough, Whitby and Bridlington each with its own character. 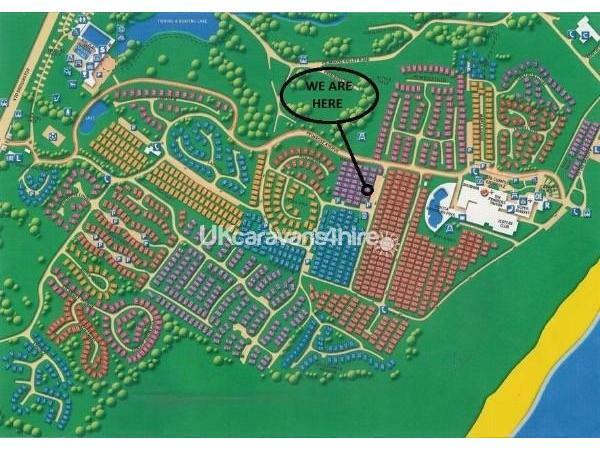 Flamingo land Theme Park and zoo is about 30 miles away. There is also the beautiful North Yorkshire Moors with its Steam Railway. Historic York is roughly 1 hour away. A local bus service comes onto the site serving Filey and Scarborough should you wish to leave the car on site. Tesco has recently opened a supermarket in Filey for those wanting a 'big shop' but the Mini Market on site is quite well stocked. Morrison’s and Sainsbury are in Scarborough. We try to leave any discount vouchers we come across in the caravan for you to use. Additional Info: Coached sport activities e.g. football, archery. Pool water sports e.g. aqua jets, water walkers. Boating Lake, Fun Fair, Go Karts, Army Laser Quest. Play Ground.